While the season still has some way to go, the destination of the Serie A title could be decided if Juventus are able to overcome AS Roma in Monday night’s top of the table clash between first and second. Juventus have looked stagnant of late, struggling to beat Atalanta at home along with 2 less than encouraging draws against mid-table Udinese and relegation-fighting Cesena. On the plus side, the Bianconeri have raised their game against seemingly better opposition with a morale-boosting 3-0 rout of AC Milan in week 22 and a hard-fought win over Champions League opponents Borussia Dortmund. At the back, Gigi Buffon will start in goal with Stephan Lichtsteiner and Patrice Evra as full-backs and Giorgio Chiellini and Leonardo Bonucci playing as the customary centre-back pairing. Alvaro Morata has really impressed in recent matches and will probably play in place of Fernando Llorente with Carlos Tevez alongside. UPDATE: Stefano Sturaro has a light sprain to his knee and did not travel with the team to Rome. 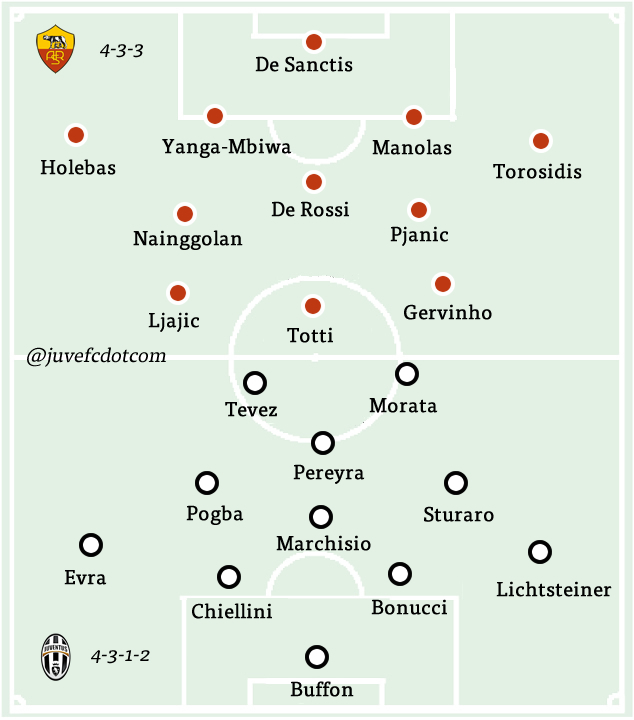 The Italian press are reporting that Allegri will revert to a 3-5-2 formation due to the injuries in midfield. The title race isn’t dead yet, because Juventus failed to annihilate it in the games against Udinese and Cesena, but it is in a deep coma and this is Roma’s final chance to resuscitate it. Cutting the lead from nine points to six would be meaningful, while a loss or even a draw would signify game over. However, Roma don’t approach this big game in the ideal conditions. They haven’t won at home since November 30, which is baffling, and they dropped points against several inferior opponents. 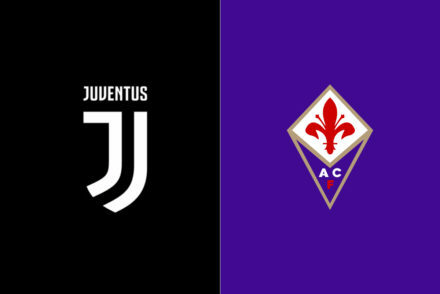 They have drawn six times in the last six matches (the lone win came against Cagliari) and for five times in a row at home (against Sassuolo, Milan, Lazio, Empoli and even Parma). 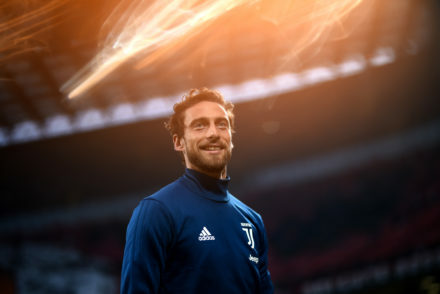 They still have the second best defense in the League, but they have conceded at least a goal in ten of the last eleven matches, including the Coppa Italia and the Europa League ones. 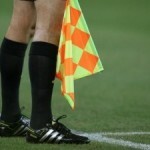 Their “pareggite,” as it is called in Italy when a team draws too much, is caused by a number of reasons. Their go-to-guy Gervinho and Seydou Keita, who had become such a strong quiet leader on the pitch, took part to AFCON and when they returned they were logically fatigued. They suffered many injuries to key players like Daniele De Rossi, Kevin Strootman, Maicon and Juan Manuel Iturbe. The January reinforcement campaign wasn’t very good: Seydou Doumbia isn’t in good shape because of AFCON and Victor Ibarbo immediately suffered an injury. Finally, the quality of the performances of some important elements of the squad, like Kostas Manolas, Maicon and especially Miralem Pjanic, has plummeted. Their confidence was shattered by Bayern Munich and they never quite fully recovered from that blow. Their stats are still pretty good: they have best average possession (61.7%), the best pass success (86.3%), the second most take-ons per game (11.3), they allow only ten shots per game (3rd in the League) and they shot 14 time (2nd). They have all the tools to turn things around, but they seem to lack that zing, that assertiveness and that serenity that they had before this recent tough stretch and they are just not in a good place mentally. When they face a weaker opponents, they no longer look intimidating. It’ll be interesting to see whether passing the round of 32 in Europa League will be enough to bring their confidence back. There are many lingering questions about the lineup. Are Alessandro Florenzi and Maicon healthy enough to play? The Italian international has more chances and he’d be fielded at right-back if he’s good to go, but Vassilis Torosidis is viable. Can Francesco Totti play twice in five days? He’ll probably have to, because he’s too important to be benched in such a big match and Seydou Doumbia hasn’t exactly made a case for being in the staring XI. Davide Astori or Mapou Yanga-Mbiwa? The former Newcastle defender has been more consistent. Juan Manuel Iturbe has returned from his knee and ankle injury, but it’d be surprising to see him start. Radja Nainggolan rested in Rotterdam, so he’s likely to replace Seydou Keita in the midfield. UPDATE: Garcia has ruled out Doumbia and Maicon in the pre-game presser, so the only doubts are who will play on the right in the defense and how the three-man midfield will be composed. In the first match of the season, Roma delivered a gutsy performance at the Juventus Stadium: they came back from a 1-0 disadvantage, but they lost 3-2 due to two penalties by Carlos Tevez and a late Leonardo Bonucci stunner. Balzaretti (groin), Castan (head), Strootman (knee), Ibarbo (calf), Maicon (knee), Doumbia (back). 4-3-3: De Sanctis; Torosidis, Manolas, Yanga-Mbiwa, Holebas; Nainggolan, De Rossi, Pjanic; Gervinho, Totti, Ljajic.